At this point, the movie that was quite unique and extraordinary can safely be called a franchise. Are they really telling the stories to get a message across anymore, or is it just for money? It’s hard to tell sometimes, because the stories do differ rather greatly compared to other horror films with similar plots. That being said, Paranormal Activity 3 improved on things that Paranormal Activity 2 blatantly failed with, but it just didn’t have half the oomph that the original had, especially in regards to the fear…so take that as you will. Continuing on with the idea of prequels instead of sequels, we venture back to 1988, when Katie and Kristi were just kids. Now, the other films talked a lot about a fire that happened when they were kids, but if you’re expecting a fire by the end of this film, you’ll be disappointed…just saying. Anyways, Dennis is the girls’ mother’s boyfriend, and he coincidentally has film experience, and initially films Katie’s birthday party. When the girls befriend a ghost named “Toby”, that’s when things begin all over again. It’s time to set cameras up all over the house to catch this thing once and for all…or not? First things first, I have to get this out in the open…this film does not feel like 1988. You won’t buy it. Not only is this camera truly a magic one…it has unlimited battery life and tape, but apparently…it’s a VHS camera that films in HD and widescreen. Here’s a little hint on how things work. A VHS camera records for one, maybe two hours tops, in fullscreen, and in pretty bad quality. For a more realistic approach, please see The Blair Witch Project. Also, they have to feed all of this footage in from three or four cameras…is it just me, or is it impossible for one man to sift through all of that footage and stay sane? Realistically speaking, this film has dropped to a new low…that being said, it revitalized some of the creep factor. Yes, the science behind the technology is all whacked up and horrible, but beyond that, the movie is better at scaring the audience than its predecessor. There is some great camerawork, and hooking the camera up to the broken rotating fan was ingenious. As soon as that fan turns and faces another direction, it slowly pans back – and you have no idea what will come popping out, if anything will come popping out at all…very smart move. Another smart move was the use of Bloody Mary…such an iconic game, and one that scares people enough to not want to try it – no matter how skeptical they are. 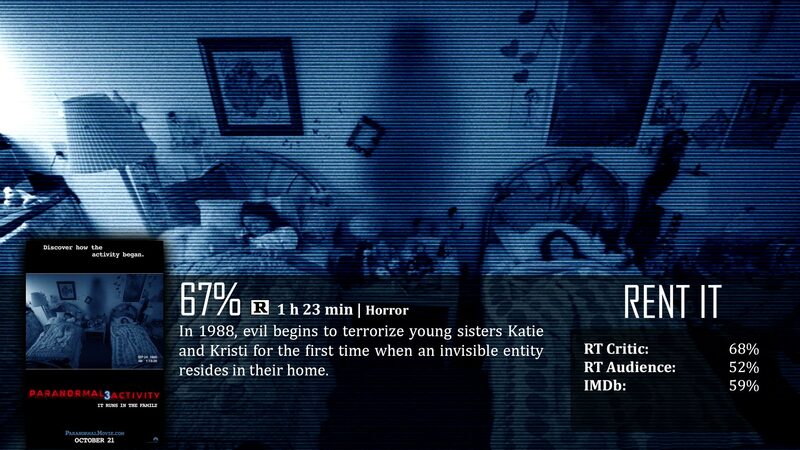 Using it in Paranormal Activity 3, you know something has to happen. Finally, little girls being creepy…I understand some of this is cliché, but it was done pretty well in order to facilitate some scares. Paranormal Activity 2 was not scary at all because they completely lost the mission of the first, but PA3 at least figured that out somewhat in order to learn from its own mistake. It still has a ways to go to actually figure out what made the original truly scary, but at least this film was able to focus on things audience members are already afraid of and take advantage of that.